A little boy has a weird upbringing. He then goes on to be obsessed with the idea of fear, to the point that he tries to capture it perfectly on camera... while killing his victims. We have slowly seen Michael Powell's descent into madness. From the great but quite inoffensive Life and Death of Colonel Blimp and I Know Where I Am Going to the progressivelly stranger Matter of Life And Death, Black Narcissus and The Red Shoes. All of these films were made with Pressburger who might have been a restraining influence. Now Powell brings us Peeping Tom, possibly the weirdest, most psychologically damaged and most brilliant of all his films. Peeping Tom is something else. The cinematography and colour, as well as the attention to detail are something Powell and Pressburger had made us used to, but the level of sheer emotional complexity of the film leaves Psycho crying in the corner. What this film has to say about the voyeurism of the viewer and the director is unsettling, as is the way that it makes us sympathise for a monster, you come out of it feeling dirty, but better off for the experience. Highly Recommended. 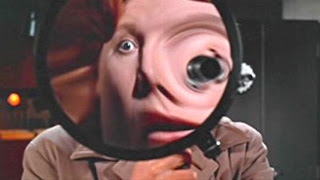 Peeping Tom was an immensely controversial film on initial release and the critical backlash heaped on the film all but finished Powell's career. However, the film earned a cult following, and since the 1970s has received a critical reappraisal that not only salvaged Powell's reputation but also earned the film a re-evaluation. He noted ruefully in his autobiography, "I make a film that nobody wants to see and then, thirty years later, everybody has either seen it or wants to see it."